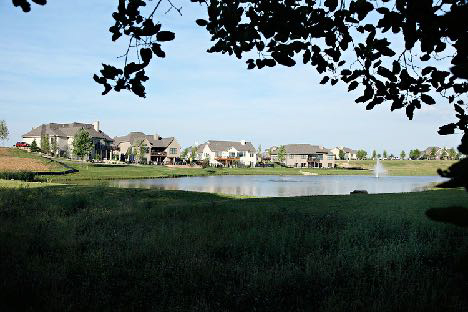 Copper Ridge is at the edge of Bettendorf yet only five minutes from shopping. There are lake views as you enter this neighborhood with winding streets and cul de sacs. A three acre lake, cattails, prairie grass encircle the stocked lake with a walking trail, and a gazebo at waters edge. Test your putting skills at the Copper Ridge neighborhood putting green. Sidewalk from Copper Ridge leads to Pleasant Valley’s Hopewell Elementary School. Public trail way system at the entrance of Copper Ridge. Copper Ridge’s 60 home sites include a variety of sizes. Sites range from 1/4 of an acre to nearly one acre. Level, daylight and walk-outs lots are available. Most sites have trees or lake views in the backyard. Homes from mid 400’s to 900’s. Make an appointment to view our model and discuss our design/building experience.